Congratulations! 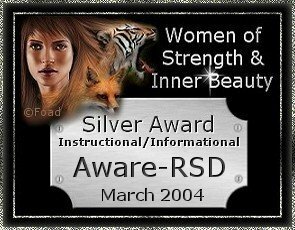 The WOSIB Judges have reviewed your site and it has won the Women Of Strength & Inner Beauty SILVER award, the second possible award of the 3 given in this catagory. Judges Comments: This site was very easy to navigate and the colors, fonts went well together and there were not alot of graphics. The pages loaded quickly. I feel this is an important site with a wealth of information. Overall, a very nice job and very much needed information. to give this award to you. 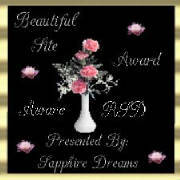 This award was made by Sapphire, whom is a new member here. Thank you so much sweety, I just love it God Bless You!! Congratulations! On your win for the Fantasy Fights Crown Web Awards for 2004. The Fantasy Fights Crown Wed Awards is a Free service and is presented to those sites whose web design; originality and content have achieved the highest levels of excellence.This is our way of giving you recognition for all your hard work and a job well done. You've done a great job on everything and it was a pleasure reviewing the site. It is a pleasure to share my award with you. Keep up the great job! All of us agreed that you truly do have a interesting web site with quality content and design.The Aloha Award is not an easy award to win. That is why this award is seen so infrequently. Proudly display the Aloha Award to let others know that your Web site is informative, unique and has won this prestigious award. As one of Worlds peak internet bodies, the Awards of The World Wide Web Awards are amongst the most prestigious available and hence, amongst some of the more difficult to win on the web. Congratulations! Your site at:Aware-RSD has been selected to receive the World Wide Web Awards "Bronze" Award. We see all the hard work and dedication that you have put into constructing your web site and your efforts are well deserved. We won both 2003-2004 & 2004-2005 awards. wonderful job and we are pleased to be affiliated with you!